Hunt Cheap Stocks With the Least P/E ratio. You just started learning the up and down world of stock market. You just learned the simple concept of buying and selling stocks to earn extra money in this field. And now, your question is, how do you pick stocks among the 300+ listed companies?! Too many choices. isn’t it?! There are several ways of picking a right stock, one of these is by using an indicator. And one of the famous indicator used in valuing a company is Price to Earnings Ratio or simply P/E Ratio. Read along! In this tsupitero blog, we will define and discuss how to use P/E Ratio in creating choices for you. Parehas na nasa category ng “property”. Akalain mo yun! Aba’y parehas din pala ang halaga ng kinita nila sa nakaraang taon (Earnings Per Share). Ang kaibahan lamang nilang dalawa ay ang current market value per share nito. Table 1. Shows the comparison between the two companies using the parameters for calculating P/E Ratio. In terms of earnings, both the Company A and B are earning Php 5.00 per share. However, we can buy company A at a market price of Php 50.00, a much lower price in comparison with Company B at Php 80.00! So, why would I buy company B if there is another company that can generate the same amount of earnings but can be bought at a much lower price? Notice that the P/E Ratio for company A is lower than company B, because company A has a lower market value(Php 50.00). There are many reasons why a company has a lower market value compared to others which is dependent on how the market participants perceive the company. P/E Ratio also suggests if a company is undervalued based on its earnings and current market value. And this is just one way of analyzing a stock. Unfortunately, the same with other indicators, P/E ratio alone cannot be used in choosing your beloved stock. A better decision is derived from a combination of different indicators. Because the market value is changing every day, therefore, the P/E Ratio also changes every day. The lower the P/E Ratio is, the more undervalue a company is. Now that you have learned how to use P/E Ratio, the next problem you will encounter is how will you compare the P/E Ratio of 300+ listed companies?! 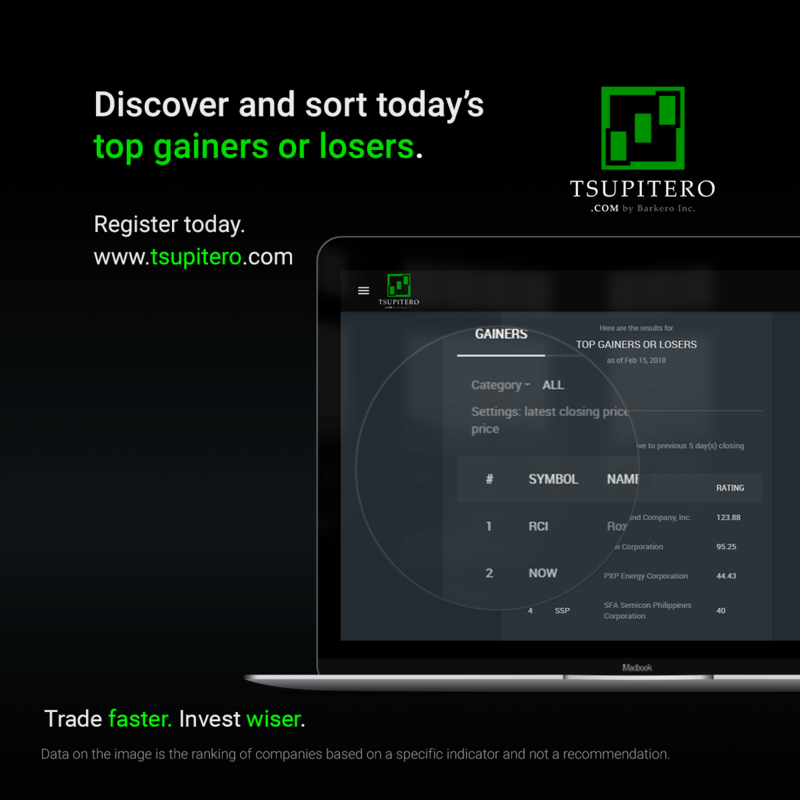 Great thing is that we have Tsupitero.com where you can see the list of companies together with its P/E Ratio in ascending order. And oh! Did you know that you can also filter the results by category? Yep! Awesome! 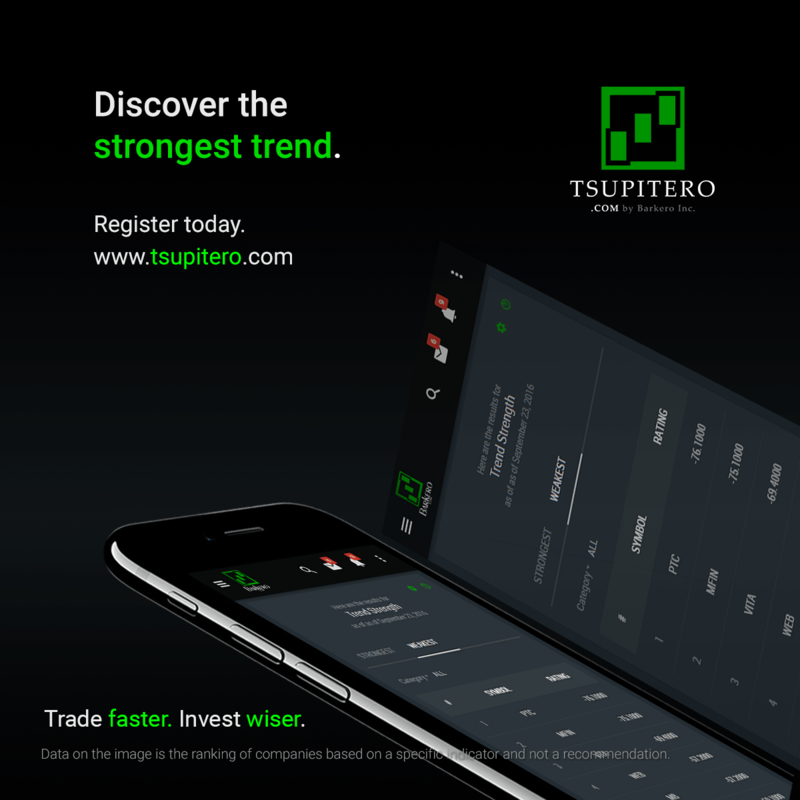 In Tsupitero Premium Feature of Price to Earnings Ratio, you can be notified thru Tsupitero Mobile App when a company in your watchlist has changed in ranking. Do you have any suggestions in your mind? Comment below! There are many benefits of a premium user, be sure to read other blogs to learn more. Register Today! The tsupitero formula for PER uses the latest closing price and the previous 4 quarterly earnings. 1. If I access on Mar 13 (a Wednesday) at 9 am, are the closing prices of Mar 12 (a Tuesday) already uploaded? If not, what time are the Mar 12 closing prices reflected in the PERs? 2. If I access on Mar 13, since the earnings of the previous 4 quarters are used as the denominator, is it correct to say that the earnings for 4Q17 to 3Q18 are used in the PER formula? Does Tsupitero move to 1Q18 to 4Q18 when ALL companies have reported 2018 results? Does Tsupitero to use a mix of earnings 4Q17 to 3Q18 and 1Q18 to 4Q18 for the PER? 1.) Yes, if you access it on Mar 13 (9am). the closing price of Mar 12 is already used in the calculation. Same data even if you access at Mar 13 (2:30pm). However, if you access it around Mar 13 (7pm) and we have updated the data already, then the closing price for that day Mar 13 is used. 2.) “…4Q17 to 3Q18 are used in the PER formula?” – Correct.